Buy Friendly Soap Shampoo Bar - Lavender & Geranium in the UK from our online shop or directly from our independent Scottish store. This nourishing Shampoo Bar is made with Castor Oil to create a deeply conditioning, creamy lather that cleans and cares for your locks and scalp. A long-lasting, compact bar with the relaxing essential oils of Lavender and Rose Geranium. No plastic packaging! This nourishing Shampoo Bar is made with Castor Oil to create a deeply conditioning, creamy lather that cleans and cares for your locks and scalp. This shampoo bar is packaged in a paper wrapper, no plastic bottle has been used it is a long-lasting, compact bar with the relaxing essential oils of Lavender and Rose Geranium. Where can you buy real Shampoo Bar Lavender & Geranium safely online? 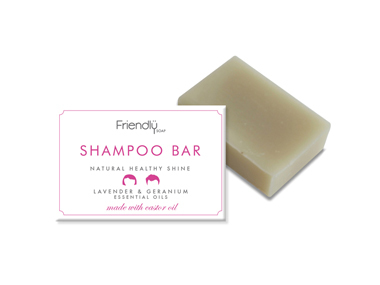 If you are wondering where you can buy Friendly Soap Shampoo Bar - Lavender & Geranium safely online in the UK, then shop with us. Shampoo Bar Lavender & Geranium - Friendly Soap Shampoo Bar - Lavender & Geranium in Shampoos and Hair Care.